There are two main drug classes use to treat Alzheimer's disease, cholinesterase inhibitors (ChEIs) and the NMDA-antagonist memantine. Both have shown statistically significant improvements in outcomes for patients with AD, but the clinical significance of these benefits is marginal at best. Furthermore, these benefits vary with disease severity, with ChEIs showing benefit from mild to servere dementia, and memantine showing benefit only in moderate to severe disease. So how closely does clinical practice mirror the evidence behind these drugs? A new study in JAGS suggests that your chances of being started on these drugs is about 50/50, and has less to do with FDA approved indications, and more to do with who you see and where you live. 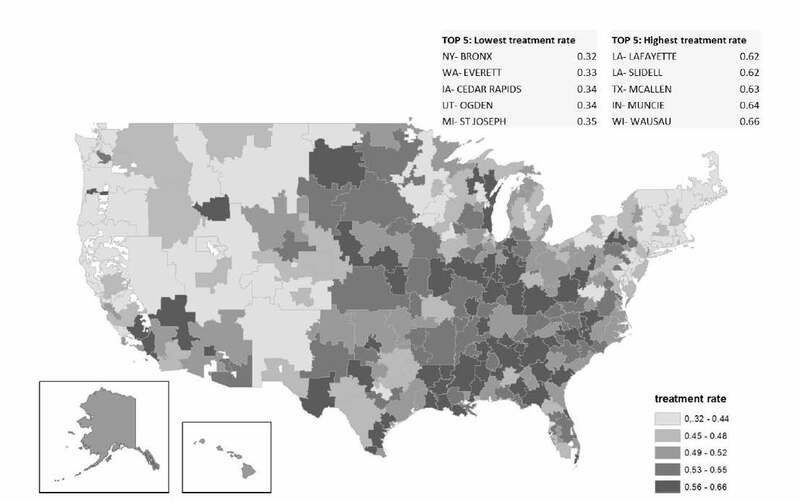 The authors used a national sample of Medicare beneficiaries enrolled in Medicare Part D from 2008 to 2010 and evaluated the frequency of ChEI’s and mematine prescription fills in people with a diagnosis of any type of dementia. They compared individuals with similar disease severity based on a proxy of whether the participant lived in residential care. Because the measure may be imperfect in its correlation with dementia severity, drug use according to whether the participant died within a year of index diagnosis was also reported. Information on visits to a neurologist, psychiatrist, or geriatrician in the 2 months before and after the date of the initial diagnosis was captured as an indicator of specialty involvement. 1. About half (56%) of all people with a dementia diagnosis receive either cholinesterase-inhibitors or memantine within a year of the index diagnosis. 2. There is no difference between use of ChEI or memantine related to the study’s proxy measure for dementia severity. Furthermore, about half (45%) of those patients with dementia who died within 1 year of their index diagnosis were on one of these agents. 3. Factors not directly related to dementia, such as race and region of residence, influence treatment rates ChEI or memantine. Turns out Bronx, NY, has the lowest rates of using them! 4. The type of clinician involved in care may independently influence whether a person is treated with ChEI or memantine. Neurologists and psychiatrists are more likely and geriatricians less likely to prescribe ChEI’s and memantine than when primary care manages alone. Apparently, if you don't want to be put on cholinesterase inhibitors (ChEIs) or memantine, live in the Bronx and visit with a local geriatrician. So true. As a Geriatrician, I see these meds prescribed all the time for any stage or type of dementia. I usually explain to patients who see me for consultation that 'doctors like to fix things and you can't fix dementia; so they feel like they're doing something if they give you a prescription.' While, the education against the meds takes longer than most physicians have, I don't find that the limited benefits of the drugs are often clearly reviewed with or understood by these patients.